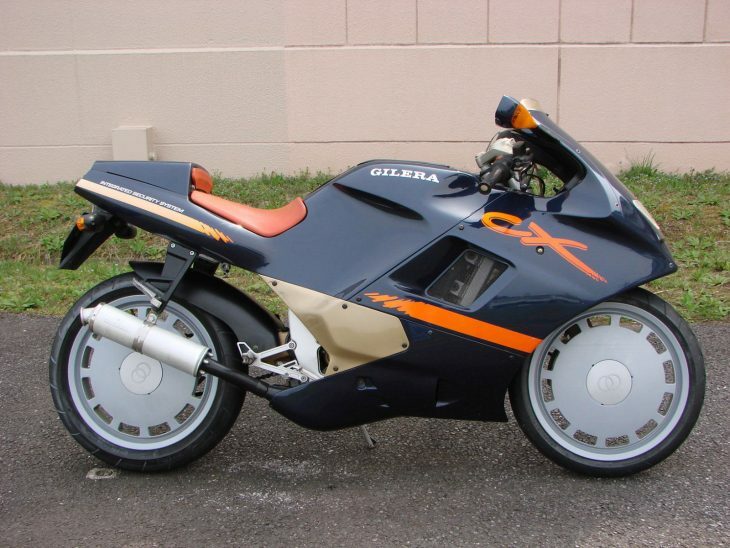 Looking very 80s, the Gilera Saturno Bialbero could be mistaken for some sort of custom Ducati. 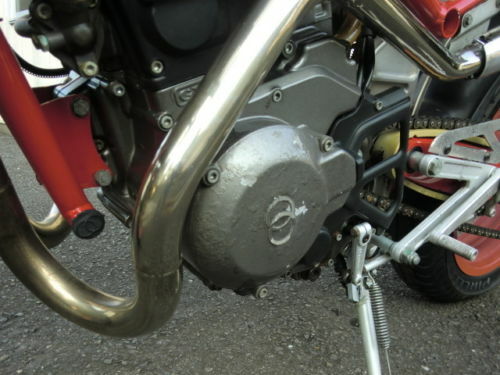 But Gilera, of course, should be held in the highest regard by fans of this site, as they were the first company to slot an inline four into a frame transversely, solving in one fell swoop the difficult cooling issues that previously faced four-cylinder motorcycles. This bike has just one cylinder like the original Saturno and embodies the company’s racing ethos, stressing light-weight and handling. 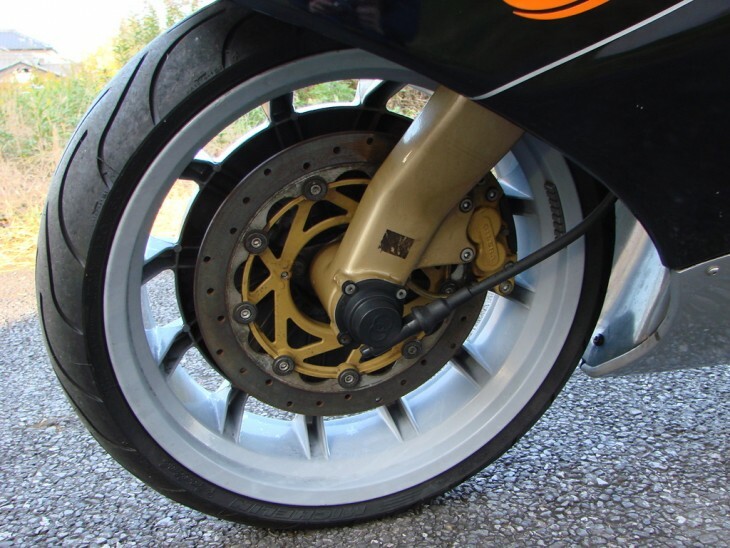 In the 80s, Gilera was mostly producing a line of offroad-biased singles with a 350cc capacity that were obviously a far cry from their road-racing bikes of the 1950s. 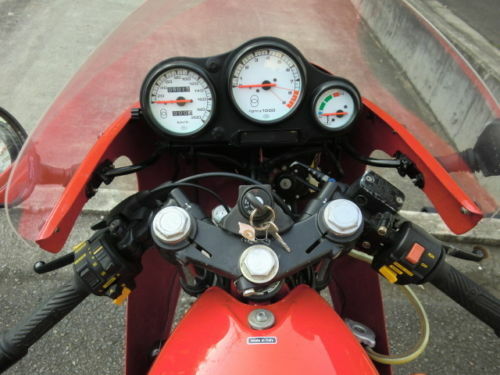 At the urging of a Japanese marketing company, they developed a retro-styled sportbike, and that updated Saturno sparked some minor interest worldwide. 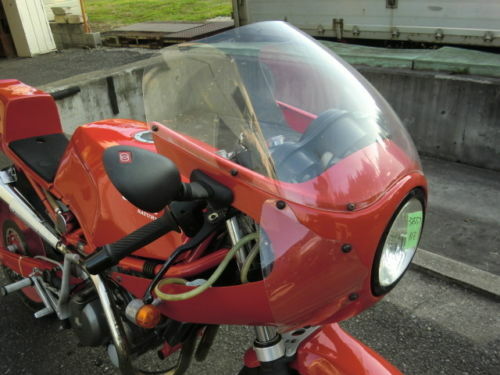 In most markets, the Nuovo Saturno was motivated by a liquid-cooled, 491cc version of the company’s four-valve, dual-overhead cam single, although a smaller 350 was available in Japan. In fact, the “Bialbero” designation helps to differentiate the bike from the earlier Saturno and refers to the number of camshafts: two. That engine put out a seemingly unimpressive 44hp, but the complete trellis-framed machine weighted in at a claimed 302lbs dry. 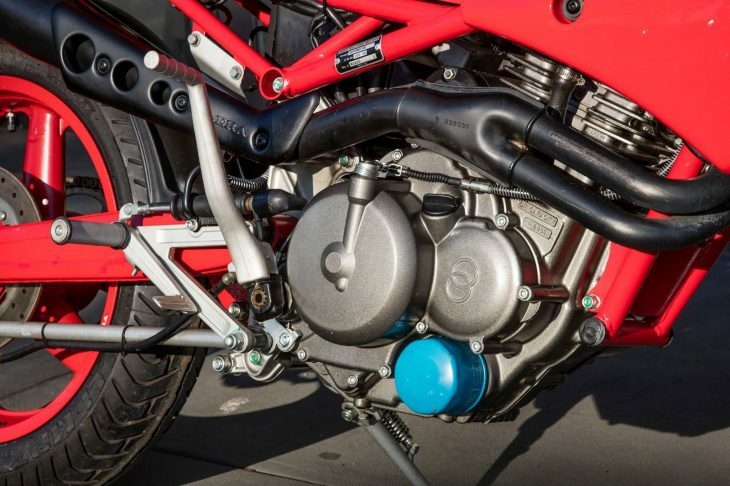 That’s 250cc two-stroke territory, with the same claimed peak output and a much broader powerband. 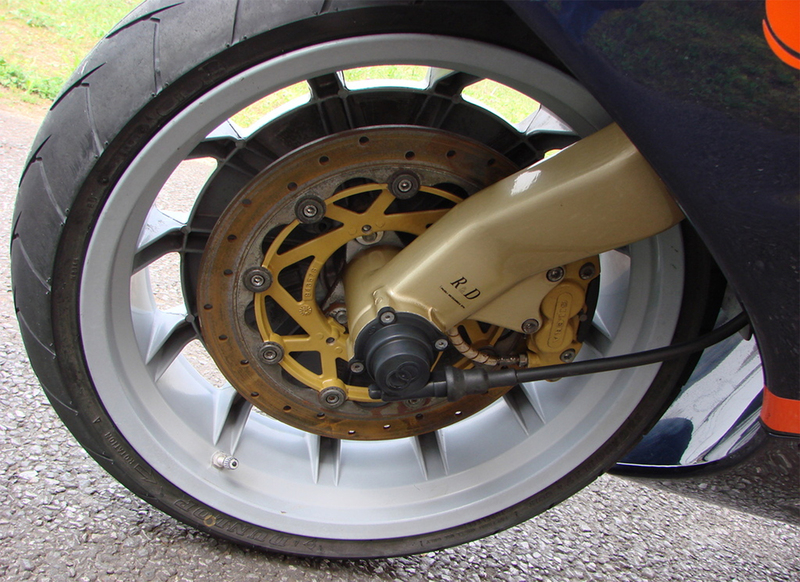 Suspension was simple but modern, with 17” Marvic wheels front and rear and a set of Brembo brakes to slow things down. The ‘box has just five speeds, owing to the package’s off-road roots, but the torquey engine should make any gaps easy to ride around. 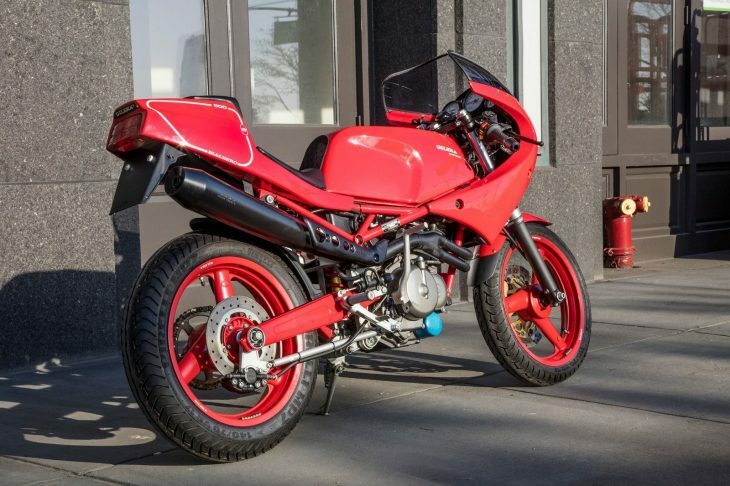 With just 72 miles on the clock, this may be the lowest-mileage Saturno on the planet, and you may be waiting a long time for an example this nice, regardless of miles: these very rarely come up for sale, as Gilera collectors aren't flavor-of-the-week types. 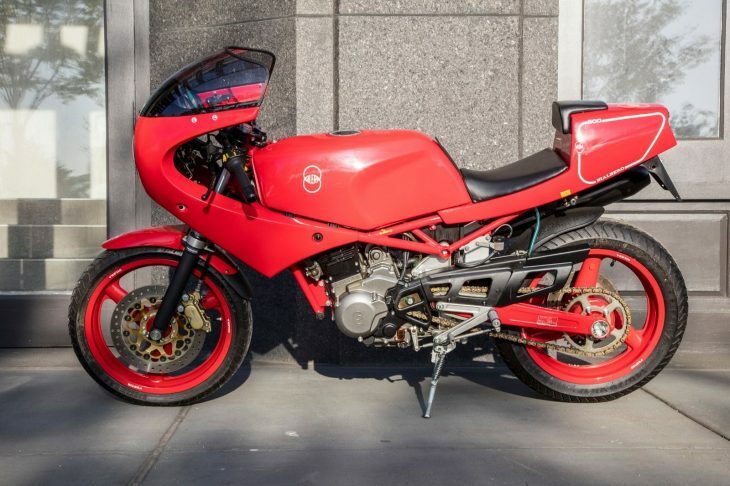 It helps that the Nuovo Saturno was intended for collectors in Japan, and only a few made it to other countries: in 1990, just 50 were imported to the UK. However, in spite of their rarity, they don't sell for huge money, making them a reasonable proposition for regular folks who want something out-of-the-ordinary. I kept this rare machine in Germany for years before I was able to legally import it this year. I don't know of another one ever available in the United States. And this one can be registered and ridden. It is in out of the crate perfect condition. Imported earlier this year from Germany. Comes with original German registration and U.S. Customs and Border Protection entry form (Form 7501). The Gilera Saturno Bialbero 500 is a motorcycle road made the motorcycle manufacturer Gilera and marketed between 1987 and 1991. 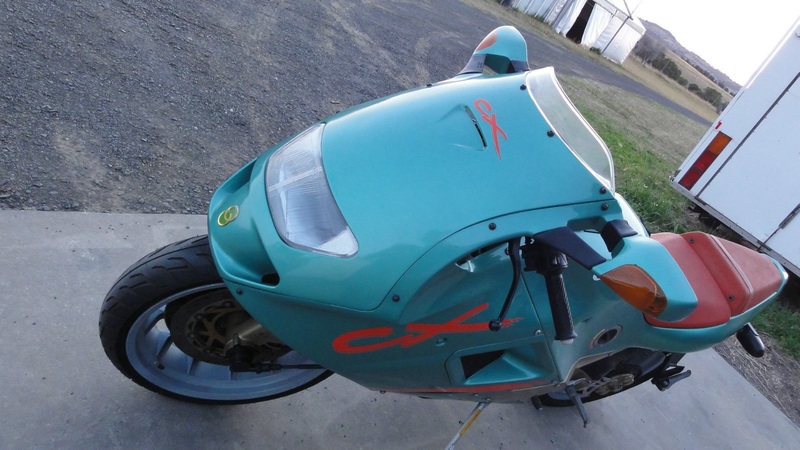 Bidding is just north of $3,659.00 with plenty of time left on the auction, if you're looking for something rare, affordable, and very fun: these are extremely nimble bikes that would make perfectly lightweight track or racing machines. 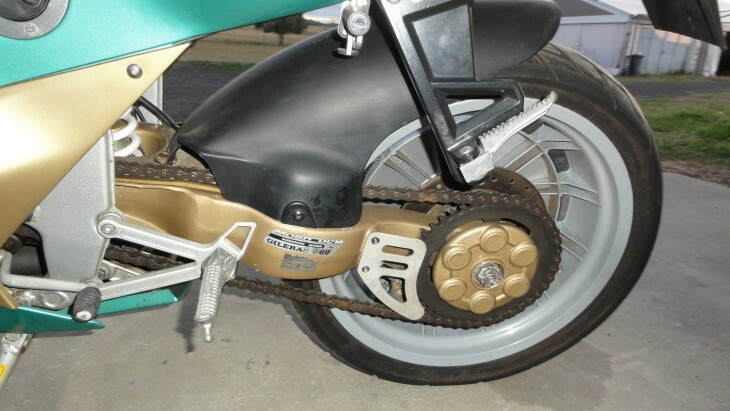 If you're handy with a wrench, there's another, much less pristine 1988 Saturno for sale on eBay right now that'd make a pretty perfect foundation for racebike to compete in something like AHRMA's "Sound of Singles" class, but this one's simply way too nice to abuse. 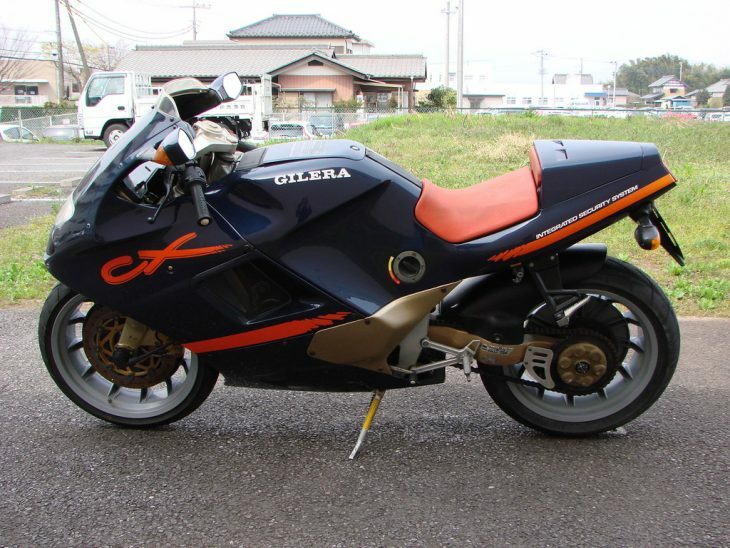 Here is one that ticks all the collector bells for me (and I think a lot of other people), a 1992 Gilera CX125. 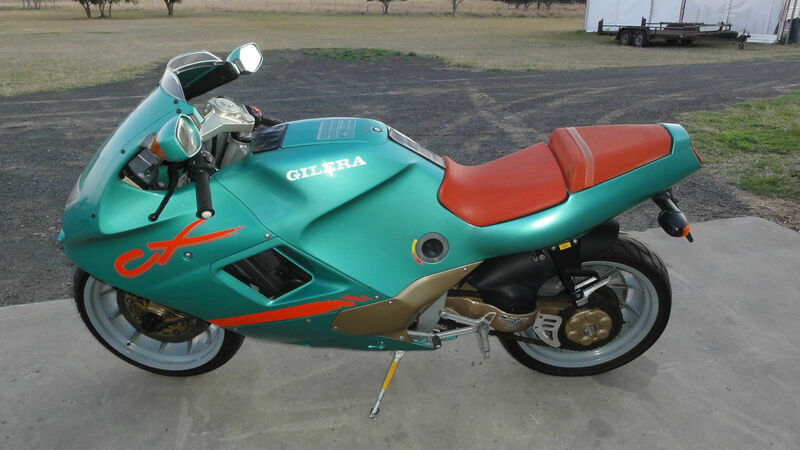 Located in Queensland Australia, this is only the second Gilera CX125 to be posted on RSBFS. 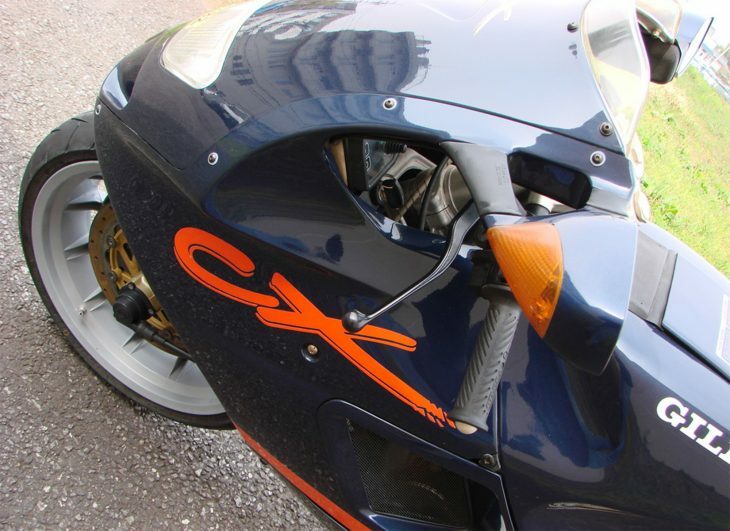 The first appeared last September and was quite popular which was interestingly since the little CX125 wasn't a popular bike when it was produced. 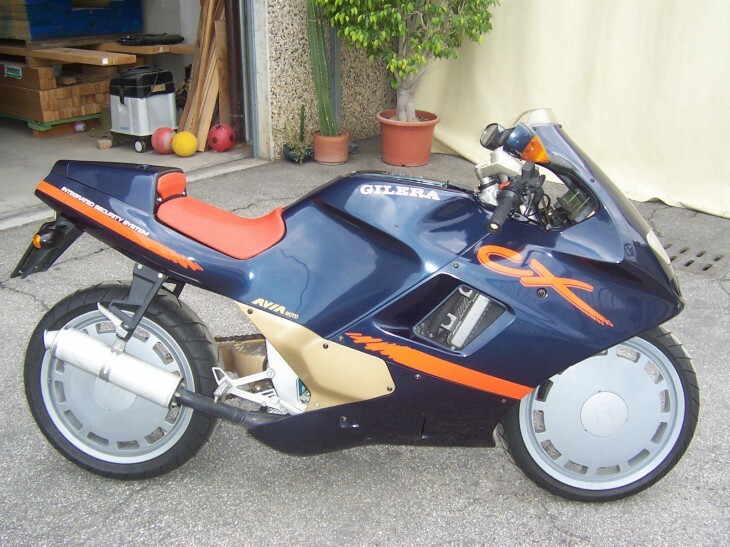 The little Gilera was part of a wave of bikes with fully enclosed bodywork such as the Honda CBR Hurricane. 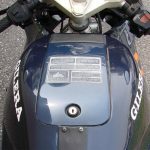 However Gilera was also forced to comply with laws in Europe that limited the displacement of motorcycles that young riders/"learners" could get their hands on to no more than 15bhp. 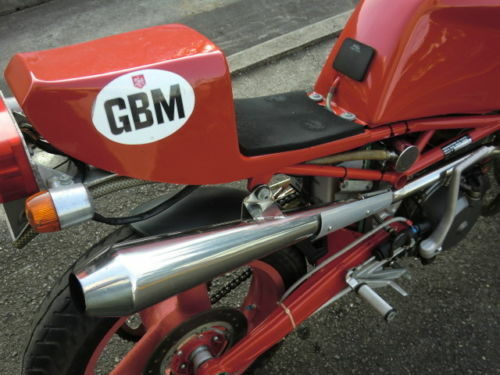 Unlike the larger firms which could use existing designs as the basis of their learner bikes (ex: Cagiva Mito based on the Ducati 748), Gilera gambled on producing a totally unique 125 design. 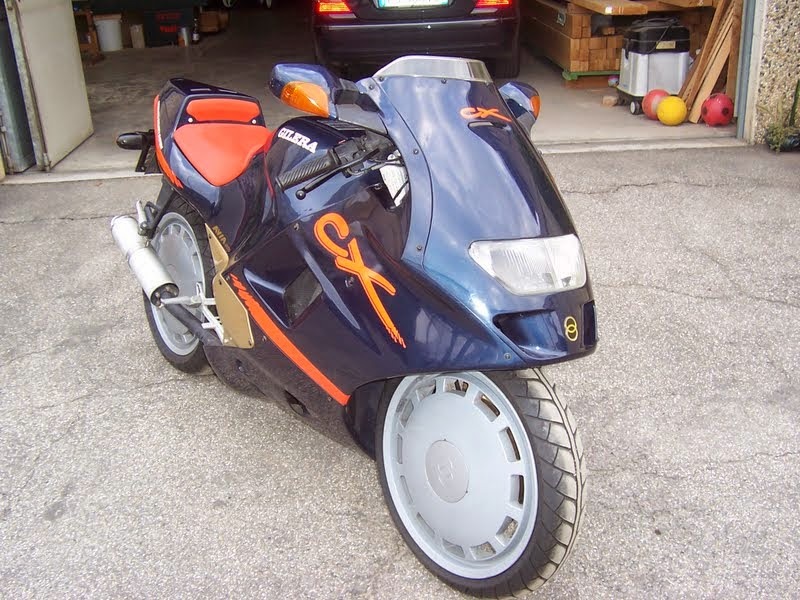 The result was what was possibly the most outlandishly styled 125 sport bike of all time – the Gilera CX125. 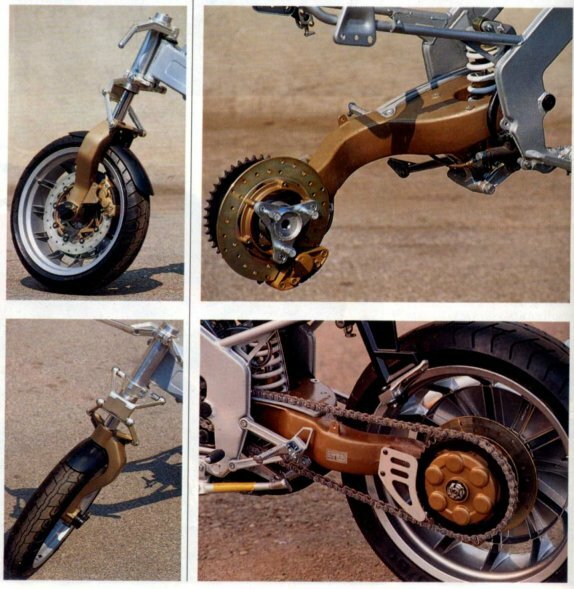 Unveiled at the 1989 Milan EICMA show the CX125 concept was a tiny sport machine with fully enveloping bodywork that looked like something straight out of a design studio, in large part due its having single sided suspension on both ends. 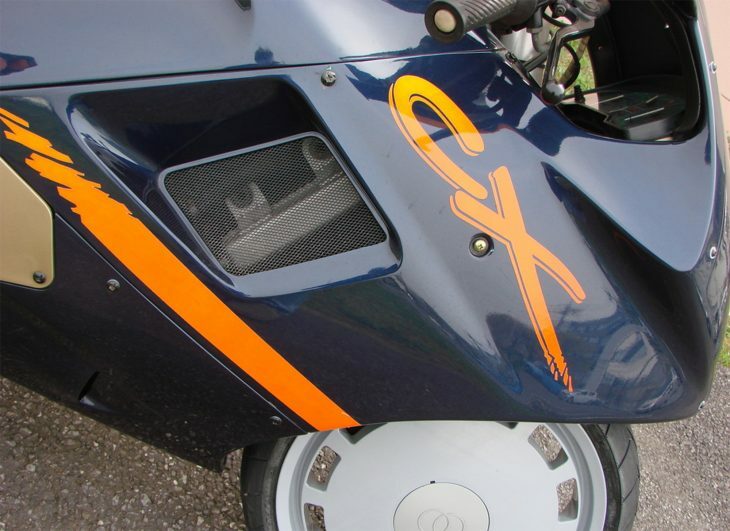 But unlike a lot of concept bikes, the CX hit the market in 1991 as an honest-to-God working motorcycle that featured the same space-age styling and radical suspension as its prototype. So what happened? Well even though the CX had a unique look the design was actually pretty conventional. Reviewers seemed to be disappointed in the bikes' being merely competent/"ordinary" on the road. As one reviewer wrote, "It’s not that the CX was wasn't a good bike, but it felt far more conventional than the styling suggested. It's essentially a bike that looks like something from the future but rides like something from the present." It also probably didn’t help that popular opinion of the CX varied between “incredibly cool” and “tragically ugly”. 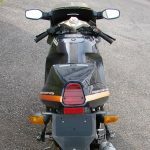 Production of the CX125 was discontinued after a year with only 1000 examples being made and parent company Piaggio discontinued Gilera’s motorcycle production in 1993. 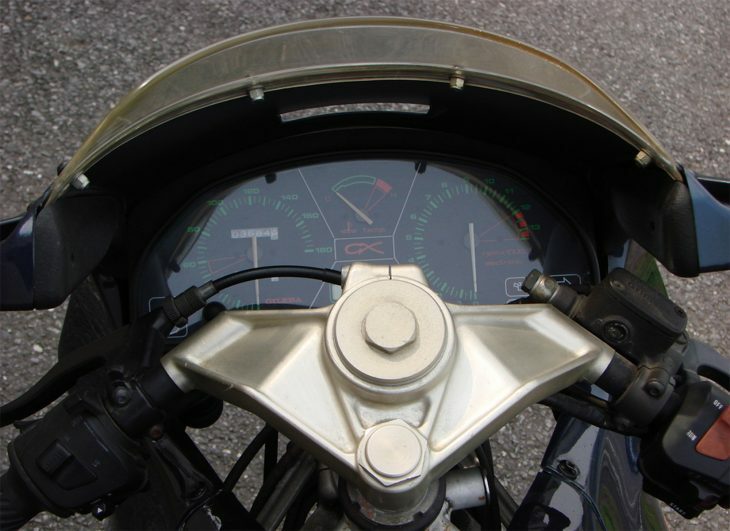 The CX is often referred to as the last gasp for Gilera as a true motorcycle producer. 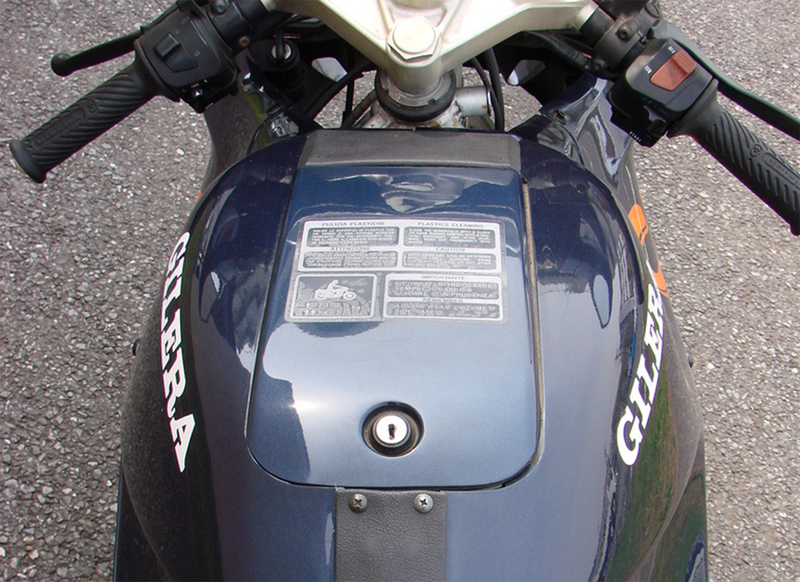 Note: The Gilera brand was continued by Piaggio but only as a scooter lineup. Asking price is 8900 AUD/6500 USD. Is it worth that? Honestly, I think it is. The seller states it only has 5083 Km and condition certainly looks to be absolutely pristine. 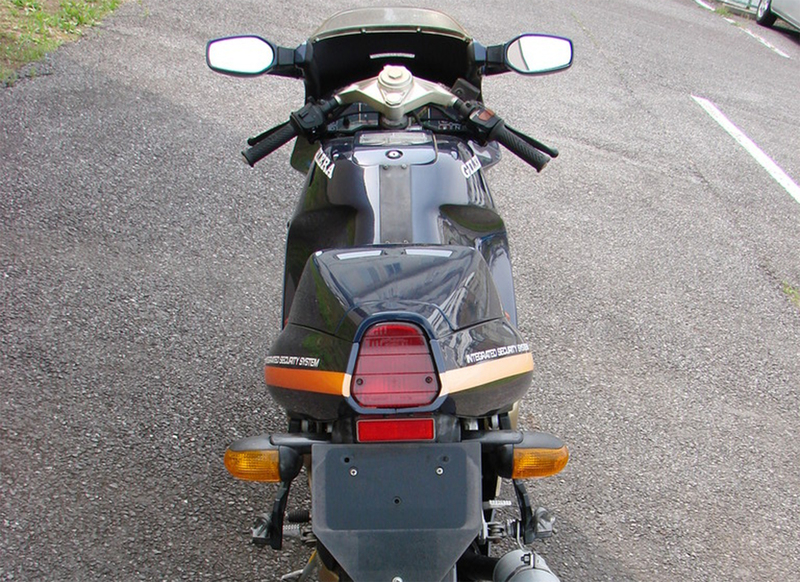 While no service info is offered and the number of pictures is less than I would like, only 1000 were made for a single model year, the technology of both front and read single sided swingarms has yet to be reproduced except for perhaps the Bimota Tesi/Vyrus and perhaps most importantly, the CX125 pretty much marked the end of Gilera as a serious motorcycle manufacturer. I think this one is a good pickup for a collector located in Australia. To be honest, if I could figure out a sure fire way to get it into my living room I would be bidding. 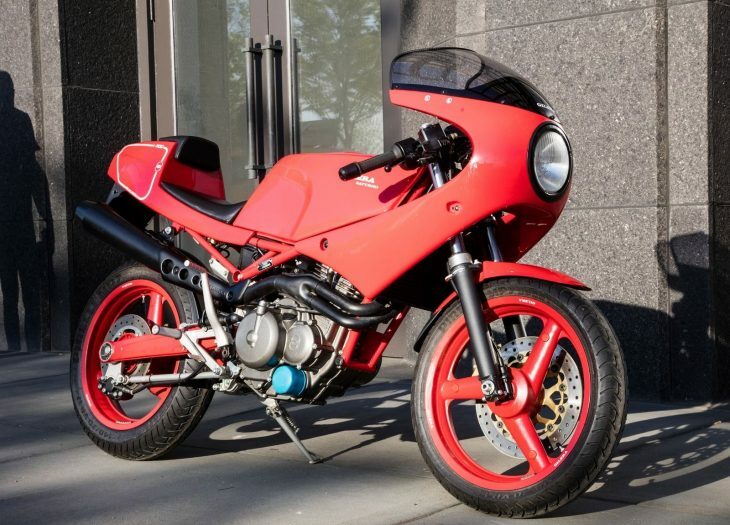 Although forgotten now, Gilera was one a famous manufacturer of serious racing hardware, and this "Nuovo" Saturno was an attempt to revitalize the marque in the late 1980's. 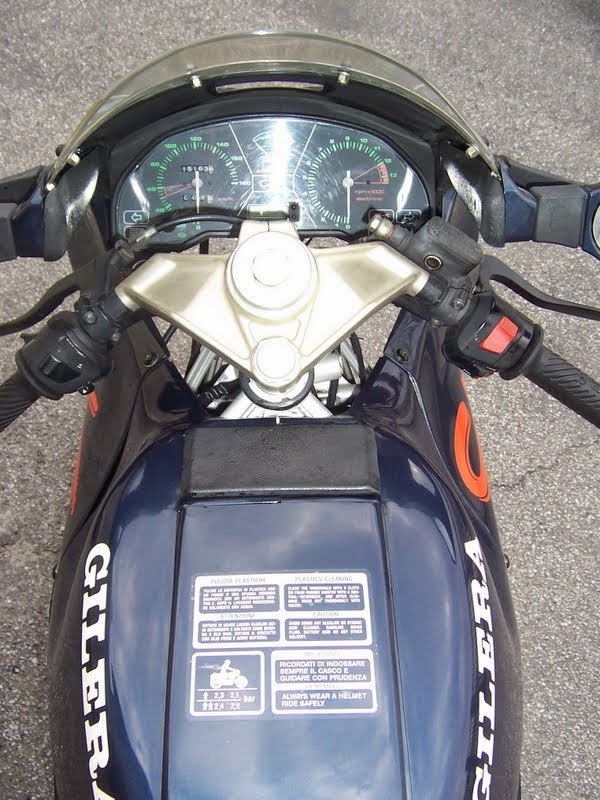 Now owed by Piaggio, Gilera was originally founded in 1909 and had a long history of high-performance motorcycles. These sportbikes were often based around big singles, sort of like an Italian Norton Manx, although they were also famous for circumventing the significant cooling issues that surrounded multi-cylinder engines by producing a transverse four-cylinder that dominated 500cc GP racing through the 1950s. The reborn Saturno was powered by a big, liquid-cooled four-valve single that put power through a five speed gearbox. Most markets got a 491cc engine, although a smaller 350 was available for Japanese customers. This simple, robust powerplant was suspended in a lightweight trellis frame with modern suspension and brakes front and rear, with lightweight Marvic wheels that provided an all-in weight of under 300lbs dry. 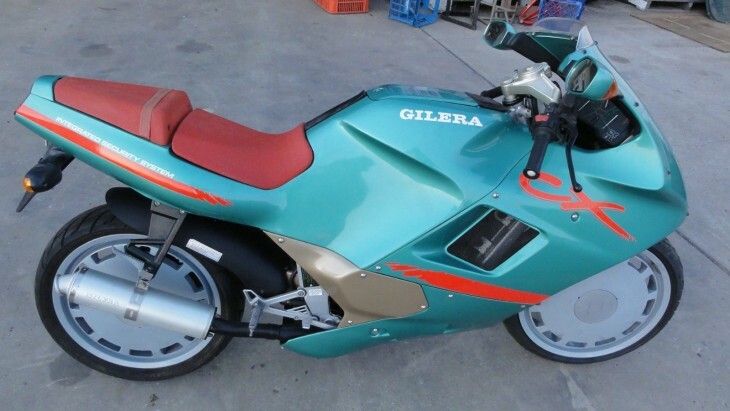 In the mid 80s Gilera collaborated with a Japanese company, C. Itoh & Co. Itoh produced a frame design and Gilera the powerplant. The frame was very similar to that of Ikuzawa. 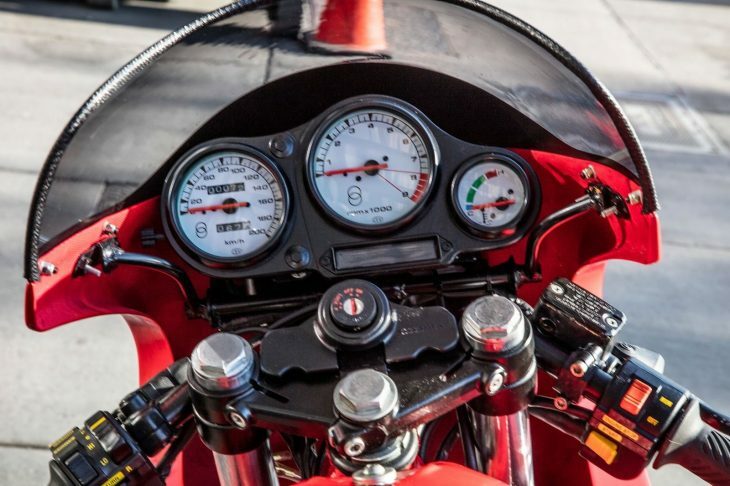 Gilera put the project in the hands of a gentleman called Sandro Columbo, who in the 1950s had been in charge of their race team.In August 1987 the bike was ready as a prototype and in March 1988 started the production. 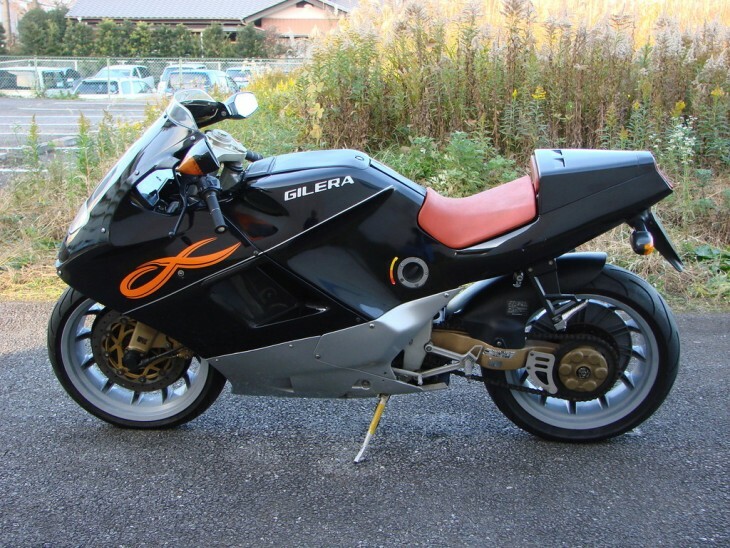 Two versions were built: a 350cc model only for the Japanese market and sold by Itoh, and a 500cc model for the rest of the world, sold through the Gilera network. The bike was by all accounts very expensive in its day and few were sold. 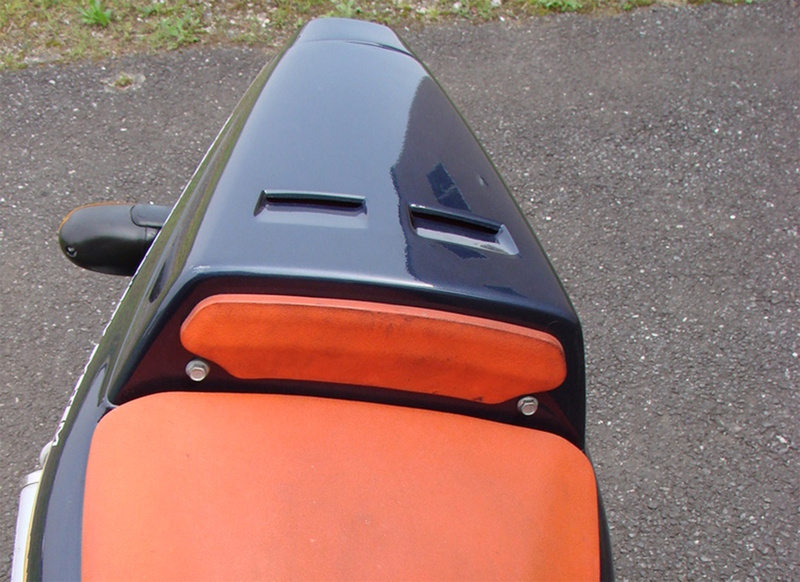 This is a 1991 example, which has travelled just over 5,100km or 3,100 miles and been very well cared for, and lightly modified with nice chrome high pipes and a bikini tail section. An rare opportunity not to be missed. Very rare in any form, the Saturno is all about light weight and handling, with a look that, to me, is very purposeful and doesn't appear "styled" at all. 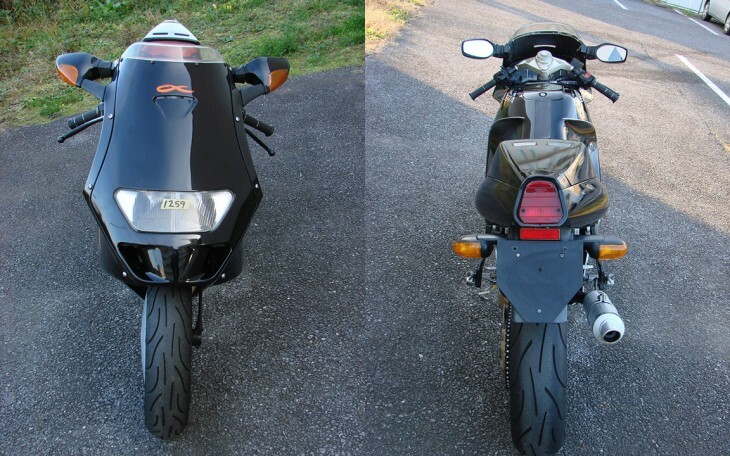 As the seller mentions, the dual exhaust on this one isn't stock as they generally use a single exhaust on the right side of the bike, but it looks to be of high quality and does suit the bike. 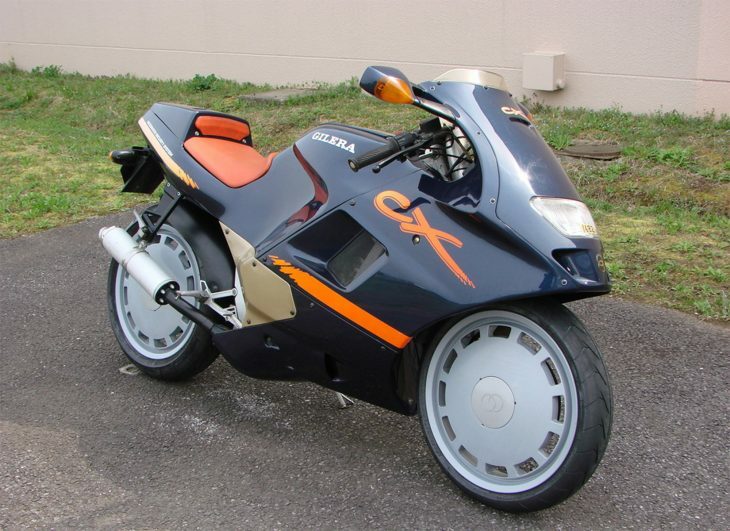 For a short time back in the 80's, bikes with fully enclosed bodywork were all the rage. 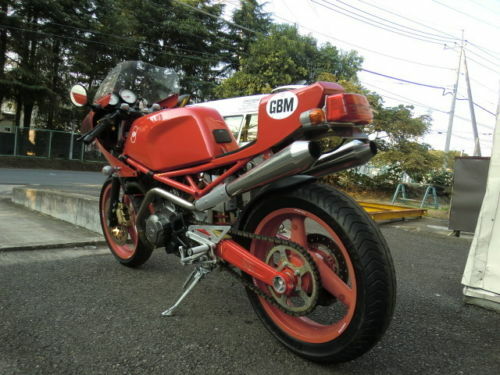 Bimota had the Tesi, Ducati had the Paso, BMW had the big K1, Honda had the CBR/Hurricane, etc. 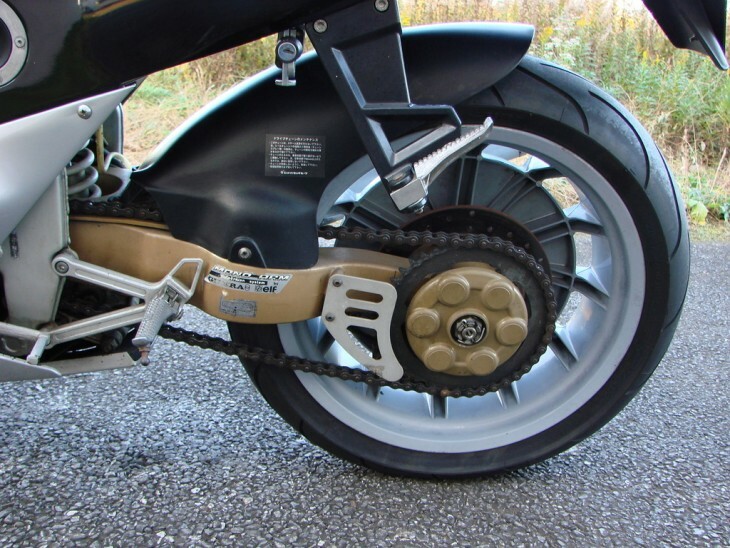 At the same time numerous european countries passed laws restricting the displacement of motorcycles that new riders could own. 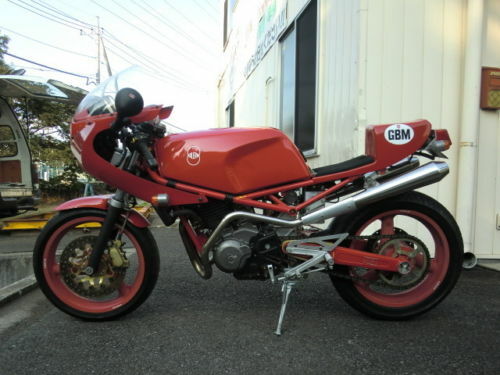 These "learner" models often had race-replica sport-bike styling to appeal to the 17 year old who had just gotten their license and wanted to look fast, even if their machine couldn’t have more than 15bhp by law. 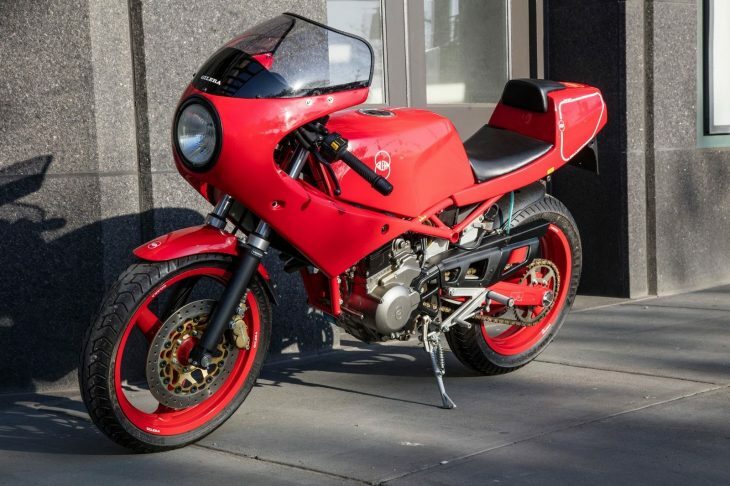 Also, most of these learner specials shared styling with their larger parent bikes so you could get a mini YZF-R, CBR, or even Ducati 916 (via the Cagiva Mito). 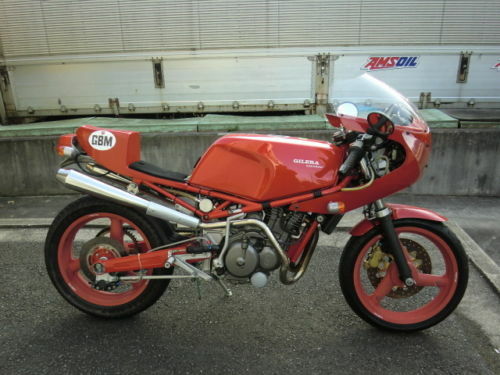 There was, however, one notable exception, one manufacturer that went all in and gambled on producing a totally unique 125 design. 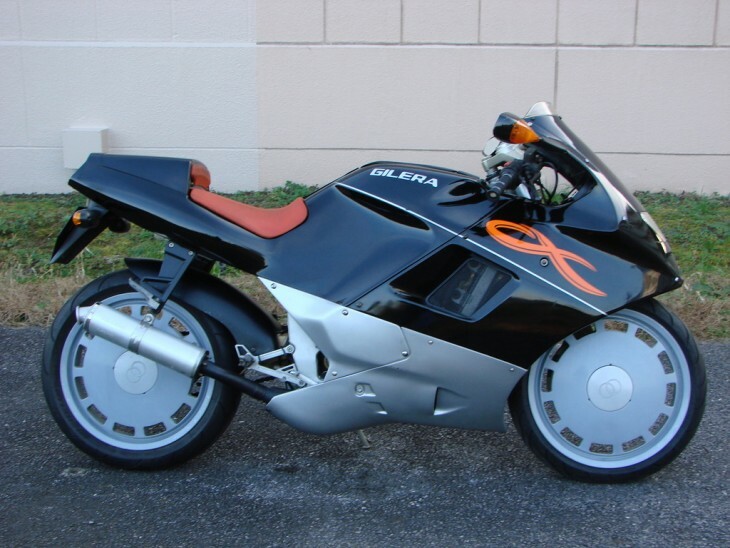 Gilera produced what was possibly the weirdest 125 sport bike of all time – the short lived and radically-styled Gilera CX125, which had some of the most futuristic design to ever grace a “beginner” bike. 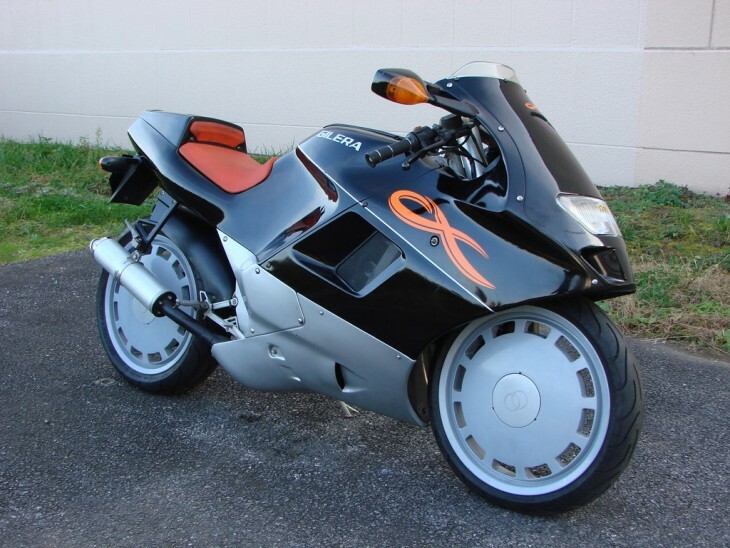 The CX concept was unveiled at the 1989 Milan EICMA show but was scarcely believable as a potential production machine. Here was a tiny sport machine with fully enveloping bodywork that looked like something straight out of a sci-fi cartoon, with a remarkable single sided suspension on both ends. 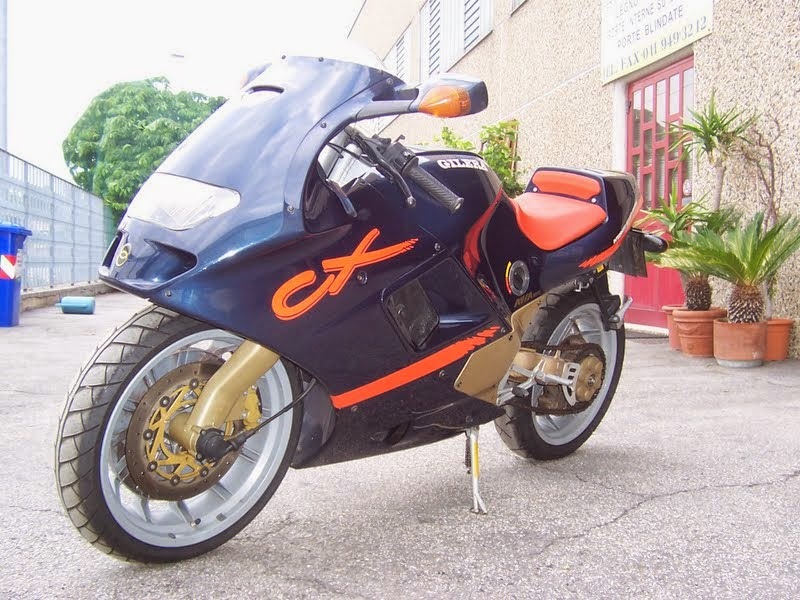 But unlike a lot of concept bikes, the CX hit the market in 1991 as an honest-to-God working motorcycle that featured the same space-age styling and bonkers suspension that the 1989 prototype had introduced. However, even though the CX had a unique look the design is actually conventional. In the press the CX was well received but there was a strained quality to the reviews that showed the reviewer’s apparent disappointment with how ordinary the CX was on the road, like they were desperately trying to find a way to make it sound as cool as it looked. It’s not that the CX was wasn't a good bike, but it felt far more conventional than the styling suggested. 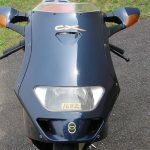 While the CX garnered attention due to its radical styling, it performed like its sister bike (the Crono model) but was slightly slower and cost more money. It probably didn’t help that popular opinion of the CX varied between “incredibly cool” and “tragically ugly”. 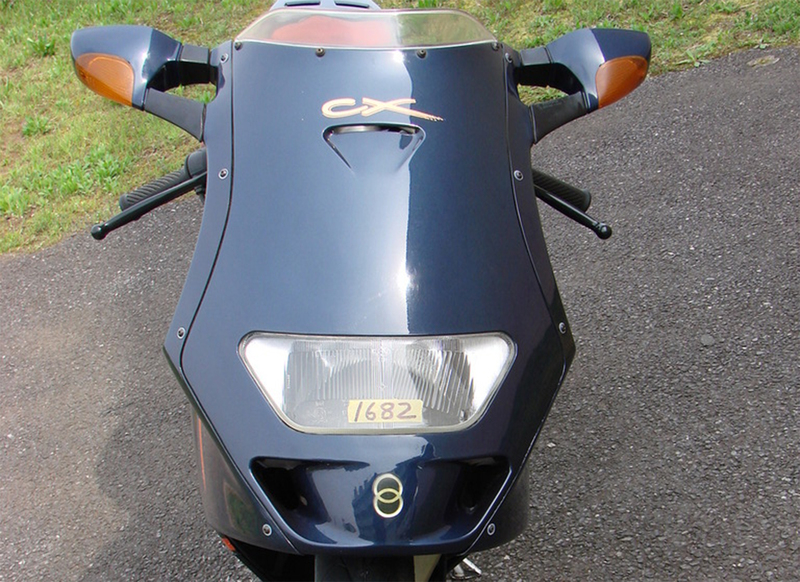 Thus production of the CX125 was discontinued after less than a year with only 1000 examples being made. 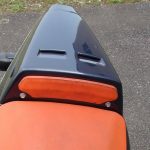 Parent company Piaggio discontinued Gilera’s motorcycle production in 1993 so the only Gilera you can get now is a small displacement scooter. Here is the listing translated from ebay.it via google translate. 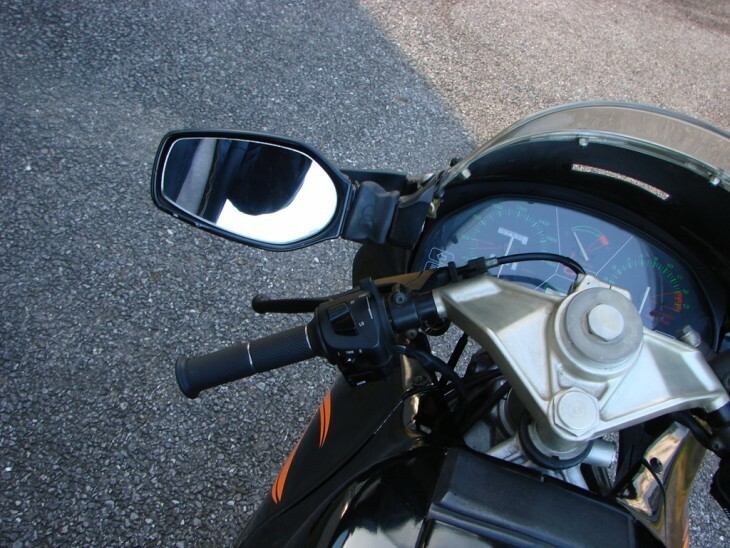 The bike is located in Northern Italy with about 15,000 KM . Asking price is a cool 4000 3800 euro,which is about 5000 USD. Is it worth that? 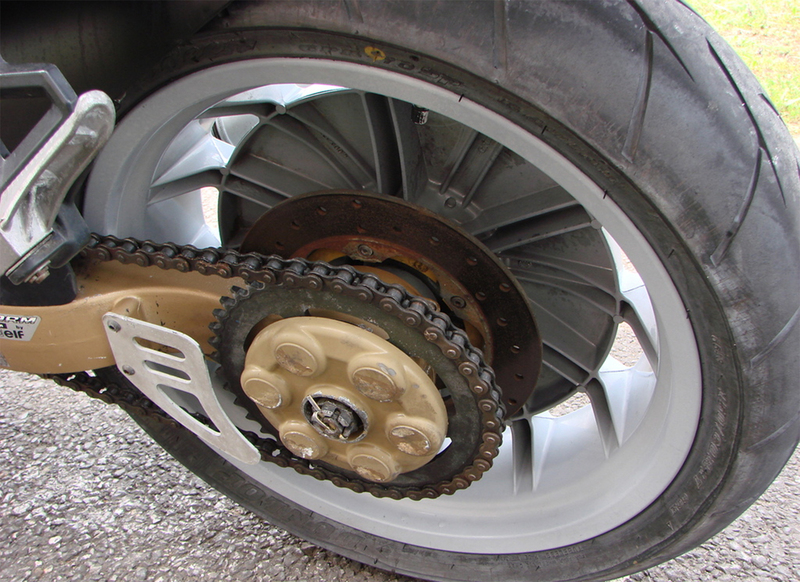 Well its a bit rough with no rear mudguard and the chain looks a bit slack. But the only other one I have ever seen is currently on display at the Barber museum in Alabama USA and only 1000 were made for a single model year. Therefore, the price may be about right. All I know is if I could figure out a sure fire way to get it into my living room I would be bidding.